In this video you will learn about three online songwriting resources that are available on the internet. These resources are extremely high quality and will be very helpful in your songwriting process, as well as add to your production qualities. Click below to view this presentation in article form. If you've like to learn more about the online songwriting resources mentioned in this video, here are the songwriting links. 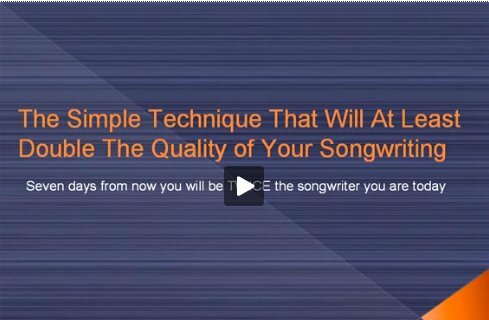 Now, let me give you some quick ideas (mentioned in the video) of the way you can use these online songwriting resources to spice up your songs. Firstly, with Sound Snap you can either find loops to use in your polished productions. There are many great drum loops... and instrumental loops, so do some searches and see what you can come up with! The second way to use Sound Snap is to use the loops for songwriting inspiration. A great way to do this is to pick a loop and "loop it over and over" for 20-30 minutes. Once you've done this you can improvise freely with the loop playing in the background. Each new loop you do this with will take you into new and interesting territory. There are two important uses for eSession. First and most obvious, to take your recordings to the next level. If you want to release an album and have success with it, using a world class eSession member to perform on your track... or mix your track to perfection, will certainly give you a better chance of succeeding! Secondly, the networking is very valuable. Once you use a musician or engineer through eSession you should be able to form enough of a bond to use them on future projects. Also, you may be able to ask them to comment on your track, and then you can use it when you market your album. Here's a hint. Be very complementary to your eSession member and let them know you appreciate them. This will give you a much better chance of working together in the future. As well, they'll be much more likely to help you out in the promotion of your work. Ok, the last online songwriting resource mentioned... Audacity! Now, it's pretty obvious that you're not getting a world class recording program. High end equipment cost big money, so don't expect Abbey Lane Studios in a free computer program. Use this program to record your creative sessions. And once you've done this, listen back to them. This feedback loop is more crucial to development as a songwriter than anything else. The longer you live inside of a feedback loop like this, the better at songwriting you will get. Period. So download the latest version of Audacity, and get recording those ideas!